From the gang here at Wild Idaho Outfitters, we would like to wish you all a very Merry Christmas and safe Holiday season! As I write this on Christmas eve morning, it has just begun to snow the type of snow fall and in the surroundings that I live in, that makes it look just like something out of a Hallmark Christmas movie. It makes me feel extra grateful for where I live. Not just the lovely area, but literally the country that we live in. It is a country that, although not perfect, has so many wonderful characteristics that people seem to be willing to risk their lives to get here. As I look around during this Hallmark moment, I see people I love dearly and think fondly of the many people who have crossed my path throughout each season of my life and as the years go by, I find myself even more grateful than ever for all who have crossed my path. Each person has left a mark on my existence. It is our sincerest hope that during this Holiday season, you, too, can look around and see the love and joy that surrounds you in the form of family, friends and precious moments of your life. If you read the news you would come to believe that there is no good in this world, but if you look around, you find so many wonderful things and people who make your life complete. The wonderful people are for to you to determine who they are, but my idea of some of the wonderful “things” that make our life in this country more blessed include our public lands system, our military that keeps us safe, and our freedom of religion that allows us the ability to worship freely and openly in the manner that we believe is appropriate. I, for one, am very grateful that our Lord, Jesus Christ, was willing to die on a cross that we might experience the greatest gift of all! As you spend time this holiday season with friends and family, we hope you take the time to thank our military for protecting our freedoms, God for your blessings and really take the time to shut down your technology to enjoy the people who make your life wonderful! 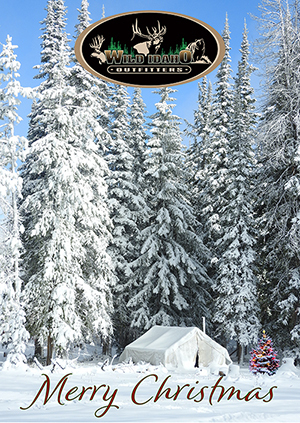 From the gang here at Wild Idaho Outfitters, nestled snuggly under the peaks of the Southeastern edge of the Salmon River Mountains, one of the gateways to the Frank Church River of No Return Wilderness area, we want to take a moment and wish all who read this a very Happy and Joyful Holiday Season!